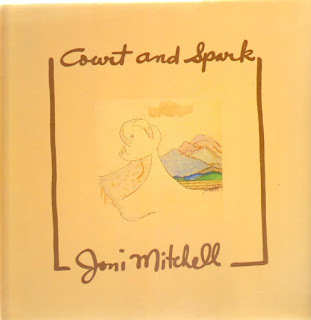 Today, a brisk autumn breeze blows through the windows of the 'rock room' catching the strains of Joni Michell's 1974 album, Court and Spark. Mitchell's best selling record is a study or relationships, using Michell's perfect microscopic focus and lyrical prowess to elicit a number of feelings through snapshot narratives and stirring instrumental movements. Bob Dylan reportedly fell asleep when the album was played for him by Mitchell, ironic because the LP captures the female view of relationship building, whereas Dylan's Blood On the Tracks dissected the male side of relationship deconstruction. The record elicits a loose jazzy sensibility and a consistent thematic thread that connects the sides of the collection. Mitchell analyses he inner conflicts, hopes and misgivings about love and the prospects of love. Her astute character developments and wordless sketches of internalized feelings make the record a stunning achievement. The opening of the album reveals itself like the approaching of day with the cathedral sounds of Mitchell's piano. The title track features soft pedal steel flourishes and spacious chiming bells of sound. Mitchell introduces the album displaying her thick comforting vocals and easing the listener into a comfortable space in order to join the narrative. The thematic statement of 'Court and Spark' drawn in the song as the wish for many and the objective for others. 'Help Me' excites the tempo using acoustic guitars and is hallmarked with Mitchell's signature silvery strumming patterns. A very popular single pulled from the LP 'Help Me' is a breezy ocean side reflection, glistening with Joni's luminescent falsetto exclamations. The sensual call for help from Mitchell is caused by her awareness that she is indeed being taken into the arms of love like it or not. A consistent emotional progression is being created both lyrically and musically through musical contrasts and thematic relationships. Another big track off of the LP is 'Free Man in Paris' which follows next and places Mitchell in a role reversal expressing her male characters new found respite from responsibility and discovered freedom as a stranger in a strange land. David Crosby and Graham Nash add their voices to the songs internal harmonies and the striding acoustic base carries the songs desirable melody line. A classic Joni song if there ever was one containing a unique point of view and attentive character development. The first side of the album closes with the song suite of 'People's Parties/Same Situation' a melodic Kodachrome of social interactions and observations as well as human misunderstandings. Built upon Mitchell's rhythmic lyricism the dynamic opening segment runs like water over clicking sticks and river bells. The detached observer sizes up the scene before settling back in contemplation. Joni's specialized lyrical content is expressed as a living stage setting through her cinematic arrangements. A proper close to side one. Side two begins in earnest with the funky anticipation of 'Car On the Hill'. Overlooking a series of jazzy changes, the song honks its way through a delicious driving groove. Finally settling in for a mid song angel choir. There is a R and B outline to Mitchell's eagerness for the headlights to illuminate her driveway. Mitchell's sly vocals tease the groove endlessly. A 'rock room' favorite, this track is an ace opener for the series of music to come on side two. 'Down to You' follows and has to be considered the 'big' song for the album. Joni and her piano begin a matched pair and are eventually adorned with feathery guitar sweet strings and choral drapery along with long time pal Crosby again making an appearance. The song acts as the ornate emotional centerpiece of the record. A reflection of time, change and conclusions exposed by Mitchell's vivid descriptions and her black and white keys. The song arcs into an emotive mid song instrumental, substantial in its cinematic qualities and as powerful in its expressions as Joni's words. The arrangement returns to the piano melody for a reprise of the melody and the core of the record has been reached. Rolling along in contrast, 'Just Like This Train' begins with a succinct ascendant introduction that rides the rails with a clip-crop groove building on the proposed metaphor of the title. Perhaps the sexyist vocals on the album, Joni's voice is rich and thick as winter syrup. The blurred landscape outside the song's window is expressed by sleek guitar swells and sensitive percussion. Once in a while a woody fiddle melody appears and then retreats to a dot on the landscape. A creative and pleasing song tucked away on side two, the song elicits a transparent funkiness through its quirky arrangement. 'Raised On Robbery', another single release off of the record begins with squishy sponge keyboards and a rhythmic Jon Mitchell vocal strata. The song soon becomes a rock and roll romp featuring Robbie Robertson guitar work in the mix. The 'heaviest' track on the album burns like a 'Band' tune and spotlights a raunchy horn solo that Joni enters into a competition with by elongating her vocal attack with sweet extended lines. 'Twisted', written by Anne Ross is perfectly suited for Mitchell's diverse range of tones, percussive vocalizations and breathy falsetto hiccups of perfection. 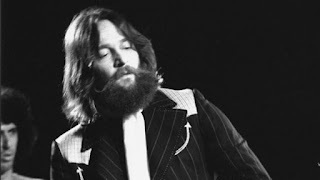 Mitchell is quoted as thinking of the song as an encore on the album. 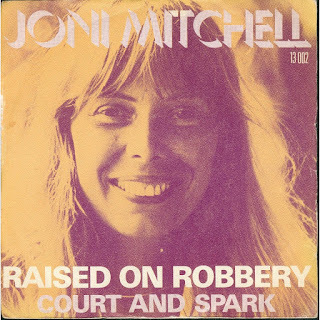 She scats over the swinging backing and her enjoyment in singing the tongue in cheek lyrics is notable as a fair haired and sly smile of Joni's is discernible in the music. Cheech and Chong make a guest appearance on the song which should illustrate the vibe of the track for those who have not heard it before. After the stark emotional dissemination of the preceeding songs on the album, 'Twisted' is a perfect garnish to the previous musical spread. 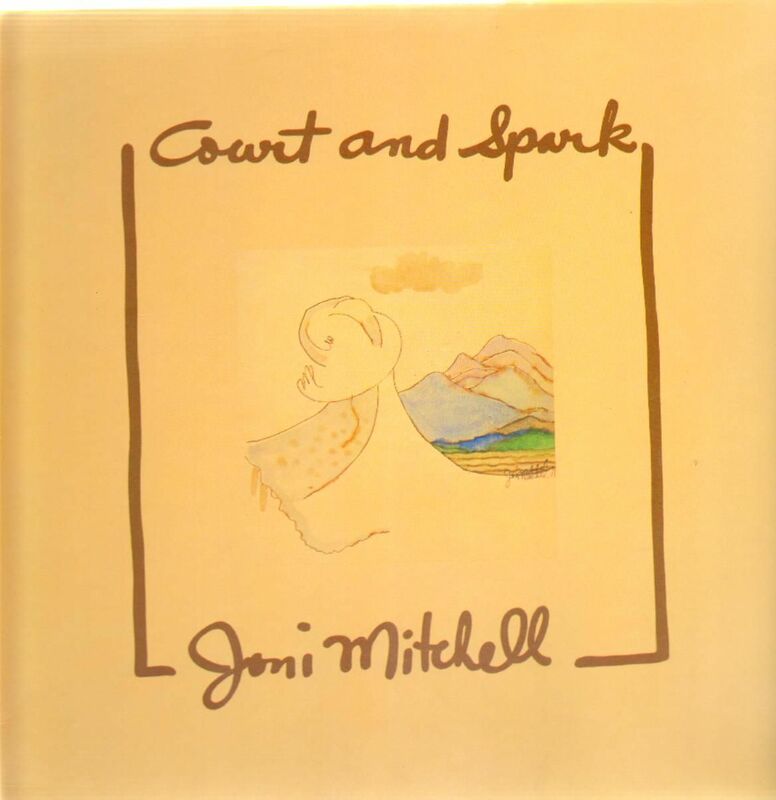 A popular album for the time, but also a record deserving of contemporary enjoyment, Joni' Mitchell's 1974 release Court and Spark is a serious collection of mature themes and emotionally soaked melodic expression. 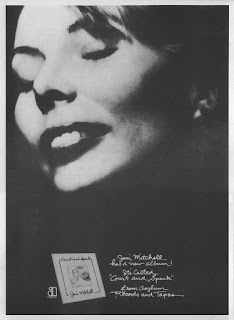 At the time of its release Joni was still a maturing artist and her personal concerns as well as her shared talents are the recipient of this records personal and musical explorations and growth. The mellow vibe of the songs is contrasted by heavy content and detailed arrangements. The collection plays well as one movement; enjoyed during a single sitting where one can let the segues play out while assisting mentally with the aural picture being painted over the two respective sides of the album.